Celebration Herbals offers a great taste with wholesome and organic ingredients. This tea currently has a 4.5 star review and carries the "Amazon's Choice" badge, for good measure. It seems like it is widely enjoyed, but does have its downside. Let's dig into this natural, herbal tea and see what's up. Celebration Herbals gives you a great tasting, exotic tea with origins from Southeast Asia. It combines three highly beneficial ingredients to make a tea with incredible quality. Not to mention that it is very much affordable, which is always a very good quality of any product. While the front of the tea box does look a bit generic, it is what is inside that makes all the difference. This is a prime example of why you should not trust a book by its cover. Celebration Herbals combines three extremely beneficial ingredients into one unique tea. Of course the three main ingredients are turmeric, lemongrass, and ginger, but there is more that also helps to make up the tea. The complete list of ingredients includes Organic Turmeric Root (Curcuma longa), Organic Ginger Root (Zingiber officinale), Organic Lemongrass (Cymbopogon citratus), Curcuma bio, gengembra bio and citronelle bio. Not only are all of the ingredients 100% natural, the majority of them are also certified organic. Not that many teas we have featured here are actually organic, so it is always a great sign when we find one that is. In addition, root teas offer enhanced benefits because their ingredients are super concentrated. This tea can stimulate antioxidant activity in the body, prevent cancer, soothe inflammation, and promote good digestion. The ginger helps with nausea, digestion, prevents chronic diseases, and increases the appetite. And, the lemongrass can help relieve pain and swelling, reduce fevers, improve blood sugar and cholesterol levels, stimulate the uterus and menstrual flow, and it also contains antioxidants. Herbal teas in general have a lot of great benefits to them. Regardless of the type of herbal tea you are drinking, there are somethings that you will be take advantage of. One benefit that you will get from all tea is weight loss. Now, this is not like the tea will burn off fat. Rather, the best herbal tea will remove water retention, so you will visibly look slimmer because you will lose a lot of your excess water weight. Another great thing about herbal tea is that you get a access to a wide variety of antioxidants, vitamins, minerals, and other nutrients. Because herbal tea often features a combination of herbs, you are able to take in a variety of great things that can be highly beneficial to your body. Other common health benefits of the best herbal tea include relaxing the body and mind, aiding in sleep disorders, reducing inflammation, easing various pains, protecting against common diseases like the cold or flu, boosting immune system, regulating the digestive system, and stimulating cognitive function. Celebration Herbals gives you three great and top quality ingredients that can help relieve pain, reduce inflammation and swelling, and even boost your immune system. Celebration Herbals is probably one of the better teas we have featured on this list. Not only are the ingredients top notch, the price is also great to see. Plus, for under 10 bucks, you are getting 24 tea bags. You can also opt to get the pack of 2, which gives you double the tea bags for just a few dollars more. So quality and quantity for a low price. Very great to see. Now, there were several complaints from a handful of people. There were some that mentioned that the taste is not what they were expecting. The majority of the critical reviews said that the taste was very strong. 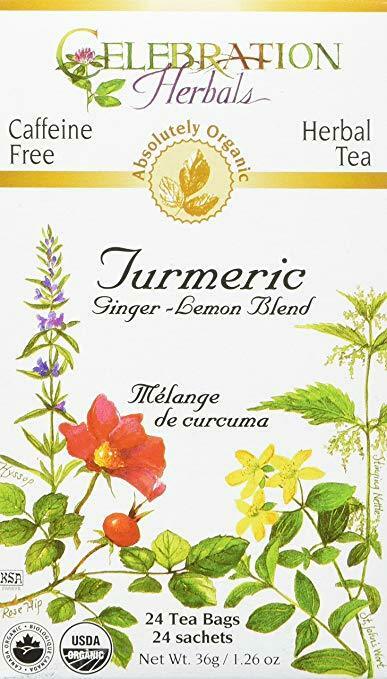 With the combination of herbs, this is not surprising, as both ginger and turmeric are very potent and strong flavors. However, the lemongrass is meant to help curb the strength of the flavor a bit. Now, their herbal products are widely varying and they have a lot available for people to try out. They now have over 200 varieties of herbal, green and black teas, as well as some bottled herbs and vanilla beans for good measure. If you are looking for top quality, 100% organic tea, Celebration Herbals has got you covered. Celebration Herbals is highly beneficial. It is mainly used to stimulate antioxidant activity in the body, prevent cancer, soothe inflammation, and promote good digestion. Plus, the ginger helps with nasuea, digestion, prevents chronic diseases, and increases the appetite. While the lemongrass helps with pain and swelling, among other issues. Some people have mentioned that the taste is rather strong. Many people are not fans of strong tea, but that is just how certain teas, like red and black, are made. If you are not a fan of very strong and potent teas, then this is not for you. Celebration Herbals offers the best quality tea possible with 100% organic and fresh ingredients. This stuff will give you exactly what you want it to with its antioxidants and other various benefits. Typically, turmeric and ginger are very strong, potent herbs that will result in your tea being rather strong. If you are not a fan of strong teas, then you will probably not enjoy Celebration Herbals all that much. Nevertheless, this tea is highly beneficial and could help with many pain related issues you may have. Overall, Celebration Herbals is a fantastic brand with a great quality tea. However, this is a very strong tasting tea, which may turn some people off. If you are one of those people, do not worry, there are plenty of other options from Celebration Herbals that you can try out. If you want to try it out for yourself, you can grab a 24 count box on Amazon for $7.65, for a 2 pack for $11.93. For more information, including the best herbal tea buyers guide, check out the rest of Green and Growing. Here are some top questions that I found for people seriously considering buying the Celebration Herbals Organic Turmeric Ginger Lemon Blend. Is this tea caffeinated? Definitely not! It's absolutely organic herbal tea. What are the health benefits? Turmeric, lemongrass and ginger are used to treat different forms of stomach and digestion-related issues. Ginger has been shown to be effective at reducing symptoms of nausea and vomiting. While lemongrass is great for reducing pain and swelling.